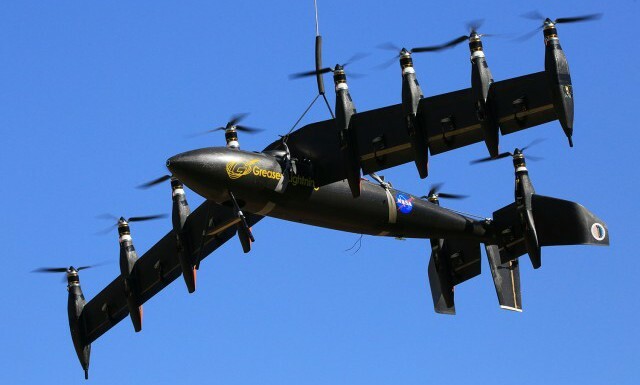 It may look like something a dedicated hobbyist built, and sound like something cheekily named, but NASA’s new electrical vertical take-off and landing (VTOL) machine is a very serious venture. Known as the GL-10 Greased Lightning, this unmanned hybrid-electric aircraft is the agency’s proposal for a vehicle that one day replace the reigning champion of VTOL – the helicopter. The G-10 is in part the result of the recent strides made in electric propulsion, which is made possible thanks to the growing power and energy density of batteries allows for some very efficient hybrid-electric aircraft designs. 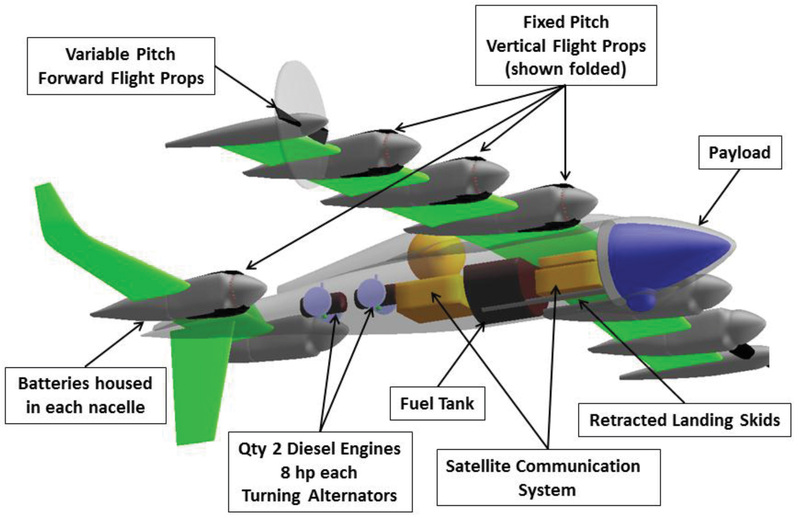 With eight prop engines mounted on the two main wings and another two mounted on the tail, the vehicle swivels them into vertical position for takeoff and landing, and then horizontal for conventional flight. While it’s not particularly hard to create an aircraft capable of VTOL, it has so far proven to be very tough to create an aircraft that can also efficiently cruise through the air after taking off vertically. The helicopter is the only common example of a VTOL aircraft that can also cruise acceptably, but at a cost. Compared to other aircraft, an everyday helicopter has a much lower-lift-drag ratio, which means it burns more fuel, has less range and can carry less weight. However, electric propulsion allows for much more efficient designs, since vehicles no longer have to accommodate large fossil fuel-powered engines or manage the mechanical stress across the airframe. Instead, they can rely on smaller, more efficient, optimally placed electric motors, and without the mechanical complexity of big jet engines, it suddenly becomes a lot easier to have wings and propellers that can swivel between horizontal and vertical. While pure-electric aircraft do exist – in the form of quadcopters – hybrid-electric designs with longer range are generally of more interest to military and commercial groups. In the case of NASA’s Greased Lightning, there are two small diesel engines in the body of the aircraft that turn electric alternators that constantly recharge the lithium batteries. This theoretically gives the GL-10 the same range and duration as a modern plane alongside its VTOL capability. Interestingly, NASA also says that such a hybrid-electric design is “scale free” — meaning the same principles could be used to revolutionize everything from helicopters, to military UAVs, to massive jetliners. Much like hybrid-electric cars, the concept is set to revolutionize an entire fleet of aircraft designs that could be far more efficient than they currently are. One party who is sure to be interested in the possibilities is the US military, with its ever growing fleet of UAVs. 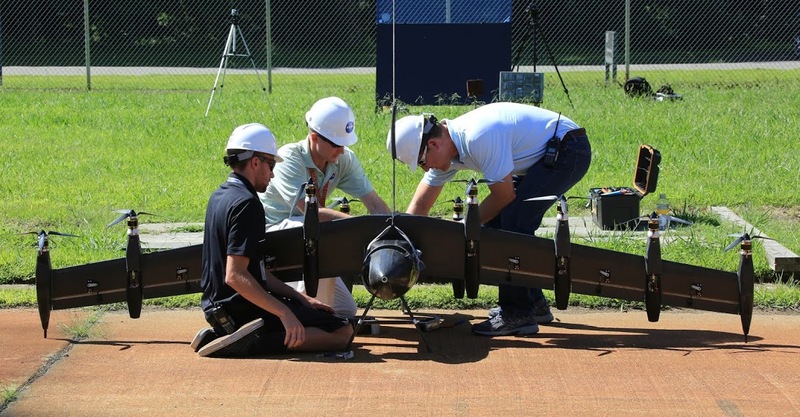 For now, Greased Lightning only has a wingspan of 3 meters (10 feet), and on its first test flight – which took place on National Aviation Day, August 19 – it was tethered. Untethered flights are planned for later in the year, an event which is sure to be a media sensation and produce some viral videos! Wacky, Greased Lightning looks like something I had planned for another novel series. At least I know it’s possible. Yep yep, everything from aerial drones to military and civilian transports. As with all things, God is in the details! Don’t you mean the Devil is in the details? Nietzsche say God, others say the Devil. Either way, it must be important. True. Speaking of God, I don’t know if you got my email, but the Jewish High Holidays are coming around, and I’m asking all my friends if they forgive me for anything I might’ve done to them this past year. Do you forgive me? How about you be angry at your government? It works for me. Attach it to an email and send it to me. I look forward to reading it. I look forward to it. Oh, and before I forget, if you haven’t checked my blog out lately, I’m still in the middle of editing VR. With any luck, I’ll find time when I’m not working on school stuff to get it done before the end of the year, so keep your fingers crossed.